Observation - Spider - Global. 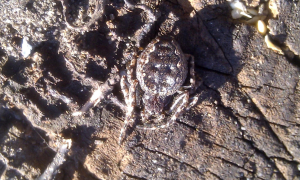 Description: A flattened bodied spider found between blocks of wood in my garden in Odense, Denmark. There were several, of different sizes, in close proximity. A flattened bodied spider found between blocks of wood in my garden in Odense, Denmark. There were several, of different sizes, in close proximity.